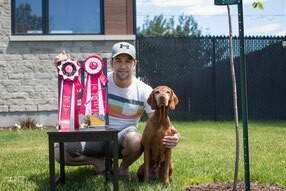 It was Vesper's first Dock Diving competition at the Avalon Ranch in Renfrew, On. Without any previous experience, Vesper impressed everybody with her high energy and speed on the dock. She got better and better all along the week up to her incredible personnal record jump of 21'6". Overall the weekend ended with a 2nd place in Semi-Pro Finals. A 1st and three 2nd place in Senior Wave. A 1st and a 2nd place in Master Wave. Props to Decoy the 7 month Nova Scotia Duck Toller who fearlessly launched himself in the pool! Nice to see. Great weekend, will try again for sure!